Whew! Four posts in one day! 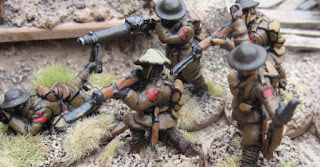 These are some of my oldest Great War figures. Most of these were painted over a decade ago. I may have even bought them from Saber’s Edge when they were still selling miniatures! Two of them are newly painting and the rest have had their helmets and formation patches touched up. The 5th (Western Cavalry) Battalion, CEF was originally recruited from Militia Cavalry units in Western Canada – but went off to war as regular infantry. Detail of the formation patch. The Red patch of the First Division surmounted by a Red circle (Red for the middle brigade of the division and the circle for the senior battalion in the brigade). Probably more of the 2nd Brigade. I have the figures – all ready to paint. Most of the 3rd Brigade is done, I think, and I need to order a few more figures for the 1st. I guess I’d better get on that!! 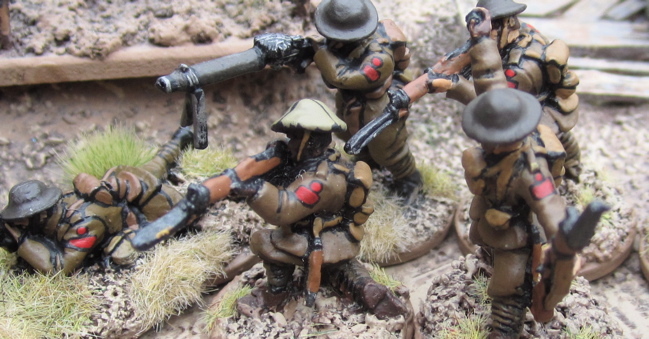 Nice figures, I did think oh and look a non prone lewis gunner but I guess you must have converted him. All the scenery looks great. Nope, they come like that. thanks! Doing some video research on the 5th for work and came across this while conducting my GoogleFu. Awesome work Tim. The wire and trenches are brilliant.